Epilepsy has been deﬁned as a disorder of the brain characterized by an enduring predisposition to generate epileptic seizures. This deﬁnition is usually practically applied as having two unprovoked seizures >24 h apartSeizures may be seen after stroke and can be considered as early or late. Early seizures usually seen immediately within the first 24 hours of stroke or by definition the first 7 days (some use 14 days). Later Post stroke seizures usually seen at 3-12 months. Early seizures which have a low risk of recurrence tend to cover the first 1-2 weeks. Post stroke epilepsy (PSE) is associated with an increased risk of death. Stroke is the most commonly identified cause of epilepsy in adult populations older than 35 years . Stroke is seen in 5-20% of those who have had a stroke. It is important to understand that not all who have an early seizure go on to develop epilepsy and many do not need treatment. Often those who develop post stroke epilepsy have not had early seizures. Diagnosis of epilepsy has considerable social and psychological impact on the patients and it should not be made lightly. Late onset seizure has a higher recurrent rate compared with early onset seizure after a stroke and will need long term prevention. The Oxford community stroke project found that 11.5% of patients with stroke were at risk of developing sinle or recurrent post stroke (delayed or late onset) seizures within five years was very similar to previous population studies. 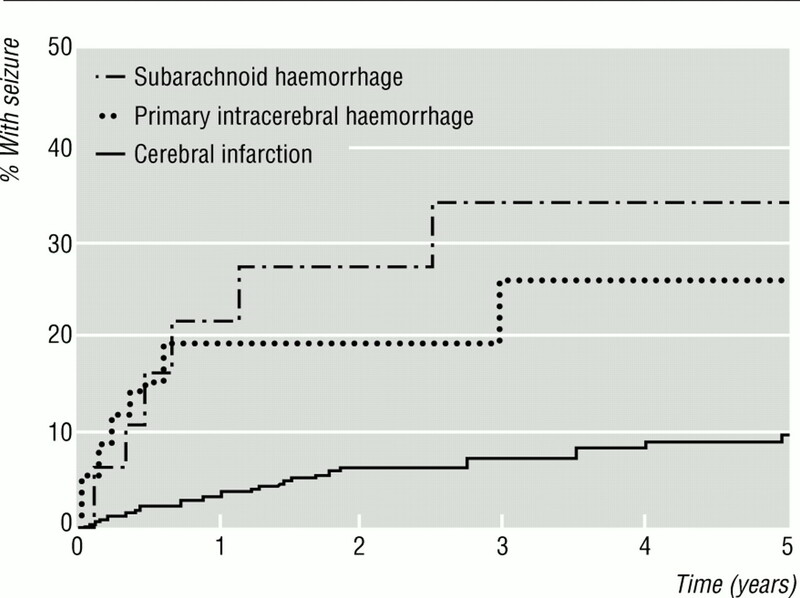 Patients with more severe strokes or haemorrhagic strokes are at higher risk. Those with a first ever stroke had only a 2% risk of having a seizure at stroke onset. Survivors who were independent at 1 month were at very low risk of future seizures . There are many different theories of why seizures occur in stroke. Possible causes are inflammation and remodelling of synaptic networks. In late PSE it is caused by enhanced neuronal excitability within and near the scar. Glutamate excitotoxicity may have a role as well as build-up of intracellular Ca and Na. 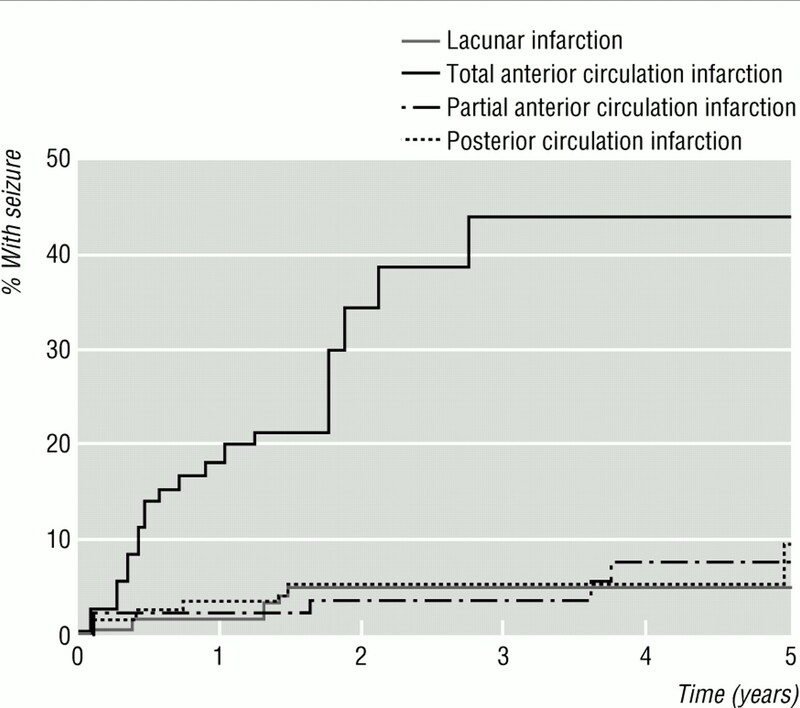 Severe small vessel disease with leukoaraiosis may also play a role. Seizures can be caused by anything that lowers seizure threshold. This may be an acute ischaemic or haemorrhagic stroke. Aggravating features include fever, hypoglycaemia, infection, electrolyte imbalance and cerebral hypoxia. Haemosiderin deposits are thought to cause irritability after a haemorrhagic stroke. Continuous EEG monitoring in the intensive care setting has demonstrated that a substantial portion of stroke patients have electrographic seizures without a clinical correlate and so remain subclinical. These are evidenty large strokes as patients are in the ITU. The most important clue is the pre-existing knowledge that the patient has epilepsy. The ED doctors need to determine this first. The patient may even have post stroke epilepsy from a prior stroke. Generally however most early seizures in an acute stroke setting occur on day 1 often at presentation and they may be of varying types such as partial/focal e.g. a twitching/weak or tingling hand. The difficulty is that most patients with acute epileptiform activity are usually turned down initially by the stroke team as there is often a non stroke causality. Scoring systems such as ROSIER negatively mark a seizure as being against a stroke diagnosis. Seziure is often regarded as a contraindication to thrombolysis. The stroke team usually only become involved when the CT imaging shows unequivocal stroke changes or there is still a residual neurological deficit after 24 hrs and perhaps more imaging is done. Any contact with ED regarding referral with an acute seizure as a stroke presentation will need to have other supporting evidence such as older age, presence of AF or early imaging changes. If suspicion is high and a time of onset is known then further tests such as CTA and MR may be used to further establish diagnose and reperfusion therapies. Some patients may present with generalised seizures with incontinence, tongue biting and may end up on the ITU before the stroke team is involved. Seizures early on in a confirmed stroke always make me consider and look for vasculitis or encephalitis and other atypical stroke causes. Late seizures often happen later post discharge at the 6-12 month mark and patients are readmitted acutely often with signs that can be attributed to a seizure focus in the territory of the old stroke. CT imaging will usually show a cortical infarct and gliosis. Non convulsive status should always be considered in any sort of hypoactive delirium or change in mentation following a stroke. Signs may be subtle looking like coma with eye flickering or other subtle clues. With a seizure affecting the frontal lobe the irritative focus causes the eyes to look to the affected side, in stroke the deficit means that the eyes look away. Todd's paraesis can last up to 4 days and post stroke confusion can in some last as long as a week. FBC, U&E, LFTs, CRP, CXR and Urine dip for infection. EEG may be useful if suspected Non-Convulsive status epilepsy. However a normal EEG result does not exclude epileptogenicity. Focal slowing or diffuse slowing activities are associated with a low risk of seizures whereas focal spikes, periodic literalising, or periodic bilateral discharges are associated with a higher risk. Delirim Tremens: always consider alcohol withdrawal and if suspected give Thiamine and Chlordiazepoxide. IV Lorazepam 1-4 mg IV. General: Those with seizures need to be kept in an area where they can be observed and seizure duration and infusions can be closely monitored along with neuro observations. Ideally the HASU or Neuro ITU is best. Side rooms are not appropriate unless seizures are seen and being managed in the setting of end of life care. After the seizure weakness (Todd's paresis) can last for several days and there may be a need for further imaging to exclude a new stroke. Post ictal confusion may also be seen. Treat any infection or electrolyte imbalance and exclude encephalitis or vasculitis if considered though very rare. ABC and give oxygen and place in recovery position. If the seizure fails to stop or recurs quickly then consider Lorazepam 1-4 mg IV. If that fails then consider IV Phenytoin 18-20mg/kg slowly over 30-60 mins with a maximum infusion rate of 50 mg/min or an alternative anticonvulsant. Some patients may require intubation and sedation and an ITU bed for status epilepticus. Non convulsive status should always be considered in an obtunded patient with no obvious cause and is treated with Lorazepam. An EEG is useful in this situation to support the diagnosis. Late epilepsy needs treatment : Patients with seizure activity more than two weeks after presentation have a higher risk of recurrence and require long term anticonvulsant prophylactic therapy. Each patient needs an individualsied assessment. Early seizures usually need no long term therapy unless there are sigificant risk of recurrence. Monotherapay is usally achieved in most patients. The choice is between Valproate, Levetiracetam and lamotrigine which are well tolerated options. It is important to optimise dosing. Those with treatment started for early seizures alone with no recurrence may be considered to have anticonvulsants withdrawn at 6 months. Later: Epileptic seizures are the most common medical cause of collapse at the wheel. Therefore, Epilepsy is a Notifiable conditions and anyone wishing to drive must inform the DVLA  and cannot drive until permission given. Seizures at the time of a stroke or within the ensuing 24 hours are currently considered as provoked but all should be referred as the decision will also depend on the license applied for e.g. Group 1 and 2. Those with ongoing seizures need optimisation of anticonvulsants and neurological input as required. Seizure prevention: General advice is needed on living with seizures. Compliance with medications is key and failure to take medications is a common cause of further seizures and even status. Advise patient to speak with GP if side effects are affecting compliance rather than missing doses. Minimise or avoid precipitants such as stress, lack of sleep and alcohol. Home advice: use guards on heaters and radiators to stop you falling directly on to them. Use smoke detectors to let you know that food is burning if you sometimes forget what you're doing or have seizures that cause you to lose awareness. Cover any furniture edges or corners that are sharp or stick out. Have a shower instead of a bath. Don't lock the bathroom door. Place saucepans on the back burners and with the handles turned away from the edge of the cooker. Avoid doing things that would place you at risk if there was a momentary episode of loss of control e.g. climbing ladders, using chainsaws etc. For those who require ongoing care it is wise to ensure that carers and those important to the patient understand what actions to take in the event of a seizure. Not all seizures require admission and for some many can be discharged from the Emergency department or managed at home or in a care setting. UK Government. DVLA driving advice. Poststroke epilepsy: update and future directions. Ther Adv Neurol Disord. 2016 Sep; 9(5): 424–435. Epileptic seizures after a first stroke: the Oxfordshire community stroke project. BMJ 19973151582–1587.